CurveEdit is a very basic, graphical viewer / editor for array data, imported from certain text files. 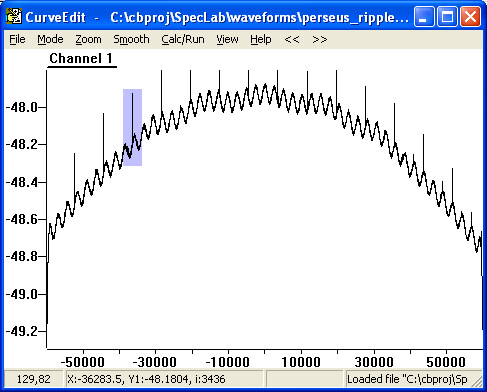 It was originally written to manipulate reference curves for Spectrum Lab (for example, to remove unwanted "peaks" in a reference spectrum; see screenshot below). The status bar on the bottom of the window shows the mouse coordinate, and the corresponding "world coordinates" including the sample point read from the data array. To zoom into a certain region, use the left mouse button to mark a rectangular area (blue), then select "Zoom In". To modify the array data point by point, select "Mode".."Edit Points" in the main menu. After that, use the left mouse button in the curve area. At the moment, the program only supports a few exotic file formats. But all these formats store the data as ASCII textfiles, so it shouldn't be too difficult to use the data in other programs, too. You can download CurveEdit from here . The zipped archive contains a "readme" which you should read (sic!) to save you some headache. Don't miss the interactive functions (for example lowpass filter / smoothing controlled via scrollbar, with immediate feedback in the graph). This program is still "under construction", and there are certainly a number of bugs lurking in the code. The entire risk is with you. You may find udates at the DL4YHF website (search for DL4YHF CurveEdit) . User feedback is welcome ! If you have a good reason why you need the ugly sourcecodes, please ask (for non-profit use only!). CurveEdit is written in "pure C" without using a toolbox (neither MFC,VCL,CLX or whatever). To install, just unpack the executable and the manual from the zipped archive into a directory of your choice. No extra DLL's are required in the current version of CurveEdit. At the moment, CurveEdit runs under Win95-98-XP. Most likely (since it only uses ancient Win32 API functions, no dot-net, etc etc), it alwo works properly under Linux / Wine. Author: Wolfgang Buescher. Mail: On my main website.